Calling all Civil War buffs, historians, and environmentalists! Join Galena for a month of historical celebrations revolving around Ulysses S. Grant’s birthday and his participation in the Civil War. Grant lived in Galena before the civil war and resided there while he ran for President in 1868, becoming the 18th President of the United States of America. He is Galena’s most famous figure and with that comes a variety of fun events to attend. Not to mention the food options in Galena are high in quality and quantity. Join Galena residents as they celebrate the birthday of Ulysses S. Grant from 9 a.m. on April 12 to 6 p.m. on April 14. The whole town comes together each year to celebrate this historical figure, and activities include a Lamplight tour of the Grant home, free admission and refreshments at the Galena & U.S Grant Museum, the 3rd Iowa Light Artillery Camp, the Main Street Walking Tour with General Grant, the Home Front Pie Auction, Women of Courage & Commitment, and President Grant’s State. On April 21, the Summit Food and Spirits is putting on their traditional Easter Buffet at Chestnut Mountain Resort. The buffet will start at 10 a.m. and end at 3 p.m. There will be plenty of options for the whole family including an omelet station, a carved ham, a quiche and lots of other traditional brunch foods. The buffet costs $16.95 for adults, $9.95 for kids ages 6-12, and free for children under 6. 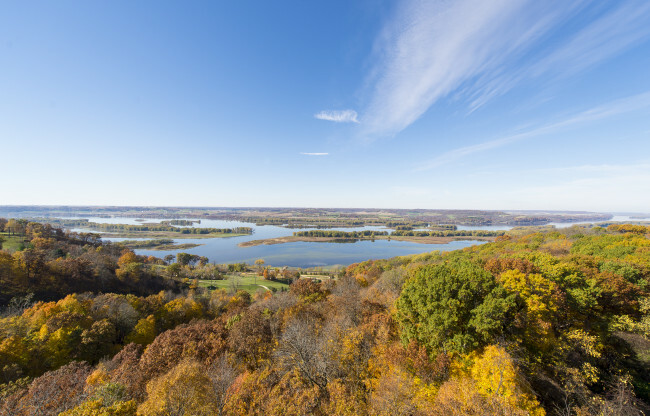 The beautiful views of the Mississippi River are also provided at no additional cost. Environmentally conscious folks out there can take part in the “Plant a Tree and Make a Difference!” efforts at the Galena Earth Day Festival on Tuesday, April 23. Every visitor will receive a free tree seedling with instructions on planting it. Attendees will also learn about trees and how they help the planet. Visit the eco-fair with local green businesses and environmental organizations to learn about recycling, repurposing, reducing consumption, wildlife and water conservation, health, energy, local food, and how to get involved. The U.S. Grant Pilgrimage is a weekend-long event beginning on April 26 for the general public and scout groups to celebrate Grant’s birthday. Civil War reenactors will be in Grant’s Park all day on Saturday, April 27. Catch the Galena Fire Department at 9 a.m. as they have their bucket brigade, an event where they pass water buckets from person to person to reenact firefighting tactics from the past. At 11:30 a.m., there will be a reenacted Civil War skirmish in front of the Galena Train Depot. That reenactment will also take place Sunday at 1:30 p.m. This is free for spectators and $10 for scouts that are involved in the parade down Galena’s Historic Main Street. There will also be a Sanitary Fair with homemade items for sale during the reenactment.